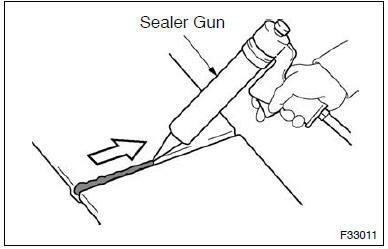 Purpose: for water-proofing and anti-rust measures, always apply the body sealer to the body panel seams and hems of the doors, hood, etc. : apply body sealer neatly to parts that require a high quality appearance. 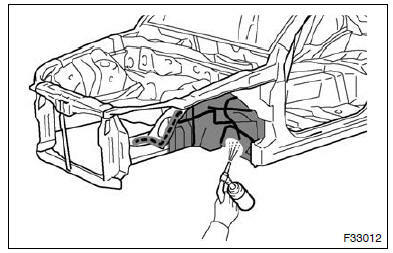 to prevent corrosion and protect the body from gravel, always apply a sufficient undercoating to the areas indicated. the purpose is to protect areas from rust which are difficult to paint such as the backside of the box-shaped cross section frame parts. : apply anti-rust agent through the service holes and/or installation holes of the parts. if the installation area of the headlight assembly is damaged, use the supply retainer for low-cost repair. 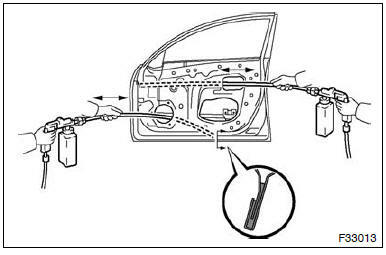 Ensure that the headlight assembly is not damaged. (1) cut off the part shaded in the illustration and smooth with sandpaper. : after cutting off the part, place the upper headlight protector retainer against the bosses and gradually file away the old bracket if it interferes with the installation of the supply bracket. (2) Install the upper headlight protector retainer with the 2 screws. : after cutting off the part, place the lower headlight protector retainer against the bosses and gradually file away the old bracket if it interferes with the installation of the supply bracket. (2) Install the lower headlight protector retainer with the 2 screws. : after cutting off the part, place the lower headlight bracket against the bosses and gradually file away the old bracket if it interferes with the installation of the supply bracket. (2) Install the lower headlight bracket with the 2 screws. (1) each inspection procedure refers to the toyota repair manual. Perform yaw rate and acceleration sensor zero point calibration with the ignition switch on (engine stopped). Perform rotation angle sensor initialization and torque sensor zero point calibration. Perform sliding roof drive gear reset.